In 2011, we made the Marotta Gone Fishing Portfolio and have updated and reviewed it every year since. A gone-fishing portfolio has a limited number of investments with a balanced asset allocation that should do well with dampened volatility. Its primary appeal is simplicity. But a secondary virtue is that it avoids the worst mistakes of the financial services industry. The Marotta gone-fishing portfolio is used by many subscribers as a free and simple way of low-cost investing. 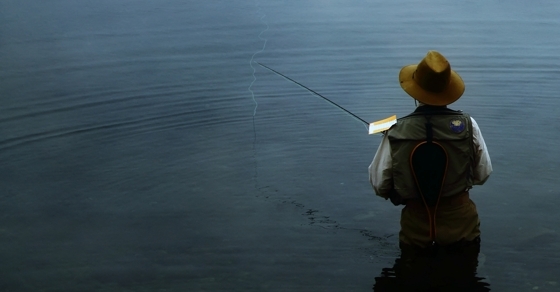 The gone-fishing portfolio provides suggested asset allocations for investors up to age 70 and up to $1 million. Comprehensive financial planning can always inform your asset allocation, but when you are older than age 70 or investing more than $1 million dollars factors like cash flow analysis, tax planning, and other wealth management services are critical to developing the optimum asset allocation. The services of a competent fee-only fiduciary can help you with these issues. Each year, we review the return of last year’s suggested portfolio for a 40 year old and offer our changes for this year. The Age 40 Marotta Gone Fishing Portfolio is 85.4% stocks, to provide appreciation, and 14.6% bonds, to provide stability for withdrawal needs. We would not expect a portfolio of 14.6% bonds to out perform the S&P 500, but this portfolio has held up well. The returns of the past three years has finally allowed the S&P 500 to catch up to and surpass the gone fishing portfolio’s annual return. The S&P 500’s annual return for the past ten years is now 7.31%. Last year’s portfolio is impressively similar with an annual return for the past ten years of 7.01% annually. That being said, last year’s returns were a disappointing. The 2015 gone fishing portfolio was down -6.88% compared to the S&P 500’s return of 1.38%. Last year, we made one change. We dropped Vanguard Information Technology ETF (VGT) and replaced it with Vanguard Mid-Cap Value ETF (VOE). We made this change to create a style box asset allocation which is very close to our ideal for U.S. stocks. Both funds are good funds, but it would have produced a better return to stick with VGT. In 2015, VGT had a return of 5.01% versus VOE’s return of -1.80%. Choosing VOE last year was unfortunate but not a mistake. We had good reasons to make this change looking forward, but looking backward it would have been better to make this change at a different time. This year, we have made three changes to the Gone Fishing Portfolio recommendation. If you were already invested according to last year’s asset allocation, you can change these positions with a simple buy and sell. The first change is to move from PIMCO Emerging Markets Bond Institutional (PEBIX) to Vanguard Emerging Markets Government Bond ETF (VWOB). VWOB seeks to follow the Barclays USD Emerging Markets Government RIC Capped Index which includes dollar-denominated bonds issued by emerging market governments, government agencies, and government owned corporations. PEBIX is comprised of unhedged foreign bonds, meaning that the payments and return of principle are in foreign currencies. Having some of your purchasing power in currencies other than the US dollar can provide some diversification. On the other hand, a hedged foreign bond fund protects payments against the possibility of the U.S. dollar strengthening. This is sometimes done by selling the value if the U.S. dollar weakens beyond a certain point and purchasing the value if the US dollar strengthens beyond a certain point. The nuances of hedging foreign bonds or getting paid back in US dollars are quite complex, but we decided that for a gone fishing portfolio even if unhedged foreign bonds made more money the added volatility was not worth it. VWOB should provide many of the benefits of foreign bonds without the added volatility of currency fluctuations. The past few years the strengthening dollar has hurt the returns of unhedged foreign bonds. In 2015, PEBIX had a total return of -2.78% versus the 1.65% return of VWOB. In 2014, PEBIX had a total return of 1.03% versus the 4.21% return of VWOB. While we don’t know if the U.S. dollar will strengthen or weaken in the future, investing in VWOB means we won’t have to worry about it. And as another added benefit, VWOB has an expense ratio of 0.34% instead of PEBIX’s expense ratio of 0.83%, the highest in our gone fishing portfolio from last year. At a minimum, we expect to make an extra 0.49% on account of the lower expense ratio. The other two changes are replacing iShares MSCI Canada ETF (EWC) and iShares MSCI Australia ETF (EWA) with SPDR MSCI Canada Quality Mix ETF (QCAN) and SPDR MSCI Australia Quality Mix ETF (QAUS). QCAN and QAUS are relatively new funds having been started in 2014. Each has an expense ratio of 0.30% replacing the 0.45% expense ratio of EWC and EWA. We only have one year of 2015 to judge these funds against the funds we are replacing, but the lower expense ratio alone is reason enough to switch. In 2015, QCAN had a total return of -20.86% versus the -23.91% return of EWC, and QAUS had a return of -9.30% versus the -9.96% return of EWA. While neither did well last year, losing less money is always a better investment return. We also made one change to the age-specific asset allocation recommendations. We removed any allocations to stability for those 27 and under. These ages had a bond allocation that was less than 2%, but young people who are saving and investing don’t need a bond allocation. If they want to keep some money set aside as an emergency fund, that amount is dependent on their lifestyle spending, not the value of their saved assets. As a result, we don’t begin recommending any bonds until a 2.1% bond recommendation at age 28. While we count on long-term market appreciation, the best way to achieve your financial goals is to moderating your spending and stay on track with your savings. The markets are both profitable and volatile, but your financial future is mostly dependent upon actions that are in your control.